Tracy's Notebook of Style: Target New Arrivals - Fall Clothing Store pics!! Leopard tee and spotted bodysuit making a comeback this season, curious if people will buy them. More of the "dressed up" sweatshirt trend with this lace version - love it! Grey leopard sweatshirt with a subtle leopard face print - can you spot it? This simple tank has tiny seabirds as it's print. This cute polka dot blouse is also cuter than it looks. 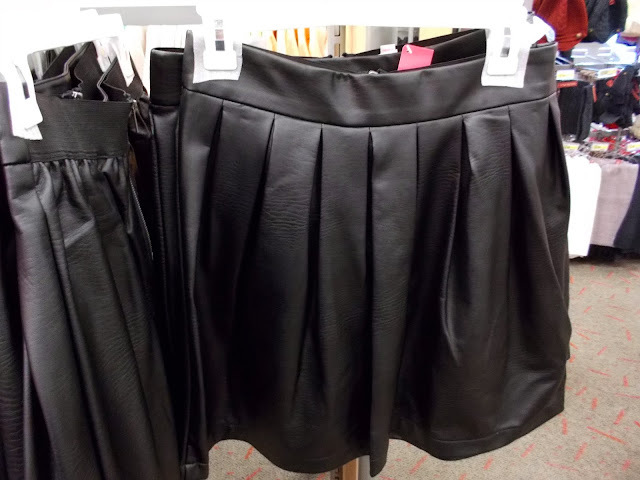 This faux leather skirt is so nice in person - the picture doesn't do it justice. This jacket is so high quality - a must if you are looking for a versatile fall piece. The second store also showed the faux leather jackets with studs. 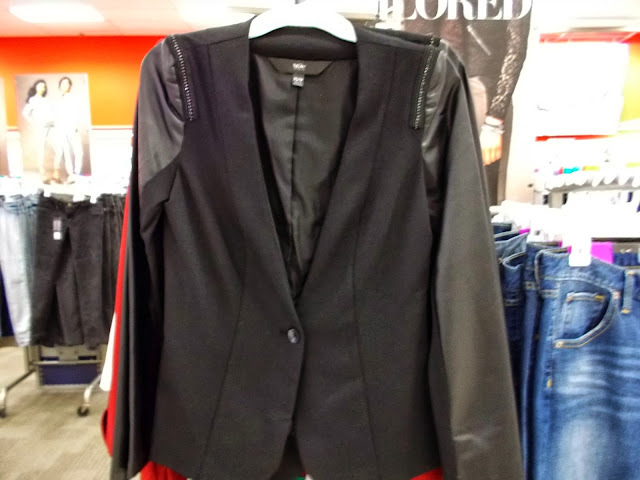 Another fab jacket to add to the list - faux leather sleeves. This reminds me of a Target designer collab piece. 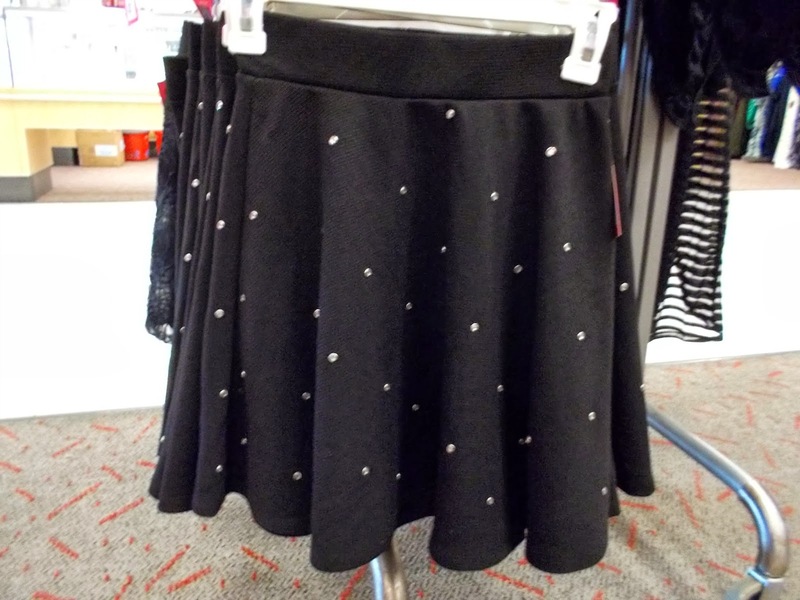 Studs and lace are everywhere. Minnie & Mickey knit sweaters. These new items are displayed like a designer collection. 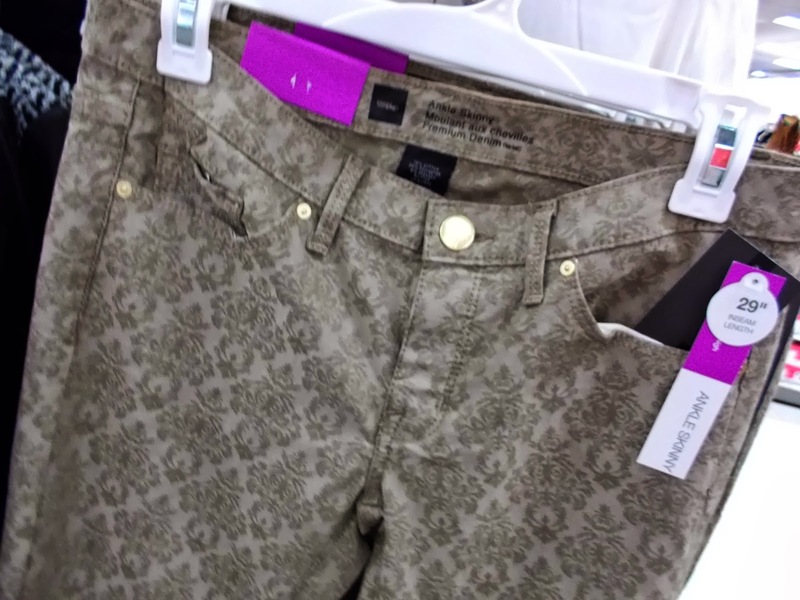 Yes, this print is on the busy side, but also a very upscale pattern and the colors work nicely together. Mad for plaid - another quality jacket to dress up for work or cute with some jeans. Love all the mix & match pieces. 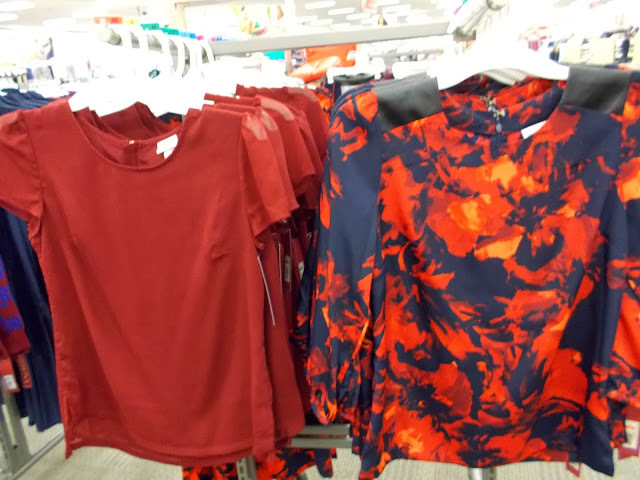 The blouse on the right in the same print, would look super chic paired with a denim. 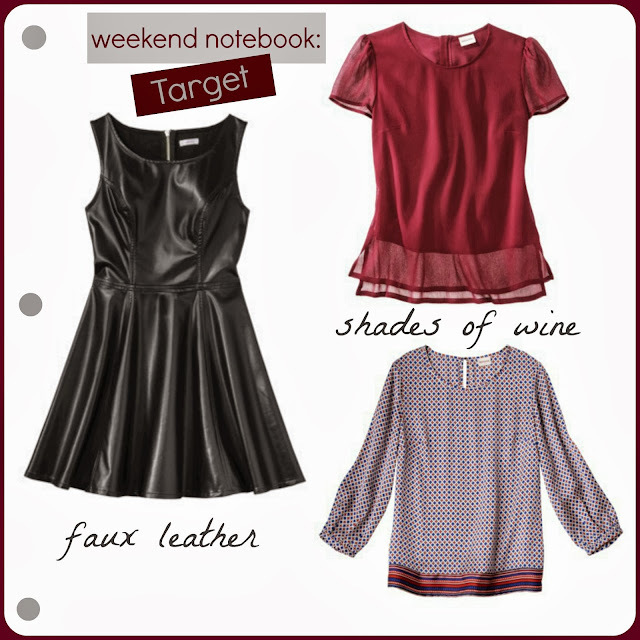 The wine blouse on the left is a cute top to thrown on with jeans or for a "casual" Friday. If you like a bolder print - this floral blouse is for you, it's actually quite pretty. Just had to share all these cute prints! Cute vintage style necklaces in the jewelry dept. That's all until next time - thanks for reading!! That jacket looks so well made, love it! I sure think so! 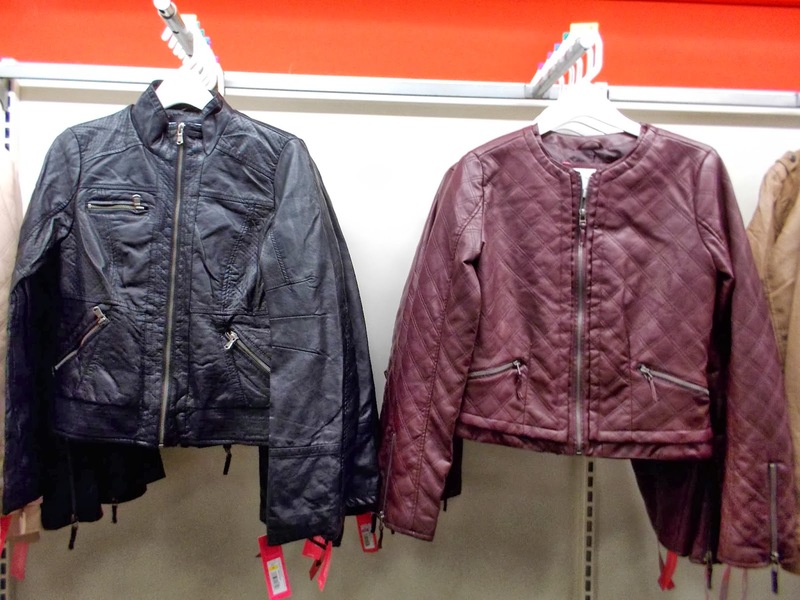 All of Target's jackets in this group look extra nice. So cute! I tried on the faux leather w/studs jacket, I love it. I'll eventually buy it too ;) But now that plaid jacket is calling my name also! I ALWAYS look forward to your posts! And I swear Target is going to make me go broke :) By the way, have you seen the J.Crew like vest that they had? Luckily, I bought it when I saw it but it's still been too warm to wear it. Thanks Trisha - love reading how much you enjoy them! Same here, I could shop at Target for my entire wardrobe and be perfectly happy. Oh, thanks for the tip on the vest, I'll be looking for it on Sunday :) It's been way too hot for me to wear any of my fall clothes either (sad face).